After I watered the square foot garden this morning I snapped a few pictures so I could share them with you. The good news is, all but 2 squares have something growing in them. The bad news? The zucchini seeds I planted were eaten by slugs. Boo! Since it’s too late in the season to plant new ones, I think I’ll just wait a few more weeks and plant some lettuce seeds instead. I’ve pretty much decided that kale is the Energizer Bunny of all seeds. Yep. Not only will it grow well anywhere, it keeps growing, and growing, and growing. It’s magical and weird all at the same time. Celery. It’s thriving in the square foot garden. I wish I would have planted more. Roma Beans. Aren’t they nice and fat? These are by far my favorite green beans to grow. Pole beans are fun to grow up tepees, but I think you get a little more bang for your buck with bush beans. What do you think? Oak Leaf Lettuce is amazing. If you’ve never tried it before, put it on your list for next year. I add a wee bit of olive oil and vinegar to mine for a quick lunch salad. And last but not least, the Japanese Black Trifle tomatoes are getting big! Maybe they’ll be ready in another week or two. We’ll see. Overall, I really like how everything is growing in the square foot garden. Before I started it this year, I really had no idea you could pack so many plants in to such a small area. Pretty stinkin’ cool if you ask me. 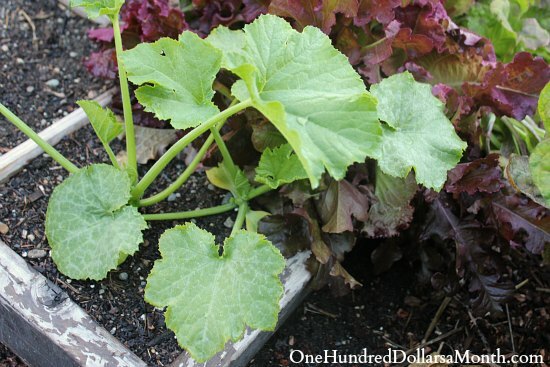 Read more about my adventures in Square Foot Gardening. Are you thinking about putting together a Square foot garden? See the how I built a square foot garden grid HERE. For more information, check out All New Square Foot Gardening. It is an amazon bestseller and the author, Mel Bartholomew is basically the king of square foot gardening. Hi Mavis, those definitely are not cucumber plants. They are some sort of squash (zucchini? Yellow crookneck? pumpkin family?) Cucumbers are compact and run. The ones you have are bunching up. I’ve been refining the square foot method for use in western Washington for about 10 years. I find that the recommended spacing for all the leaf crops is too tight to be able to control slugs effectively. I tried an idea for making planting easier and I love it. It involved using a paper napkin to make a “planting seed” pattern. I added one thing to it. I marked off the paradigm for lettuce and one for radishes and glued the seed to the napkin in its proper place. Then, before laying the napkin into the square, I sprinkled the square lightly. When I then sprinkled soil over the top, the napkin wasn’t moved a all. I so appreciate your reader’s idea. BTW, to prevent your slug problem, I suggest you put bottle caps of beer around the zuch planting. The slugs drink it and die.